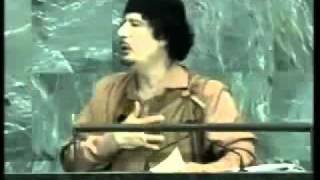 In some ways this speech is prophetic , as Gadaffi identifies the very inequities inherent in the UN that were to become the instruments of his murder & the annihilation of Libya. The control & abuse of the 'security' council & 'permanent member' status by a small number of countries which have granted these special powers to themselves! The repeated use of the UN security council to commit wars of aggression which serve only the interests of the small number of powerful groups controlling the UN. Colonialism continues to this day & is enabled by a corrupt & captive United Nations & enforced by it's NATO thugs. In other ways, this speech is naive in his open hearted acceptance of Obama who had just come to power.